This frozen mint chip pie is a creamy, dreamy summer dessert. It’s an easy make-ahead, no-bake dessert that’ll please any mint lover in your life. 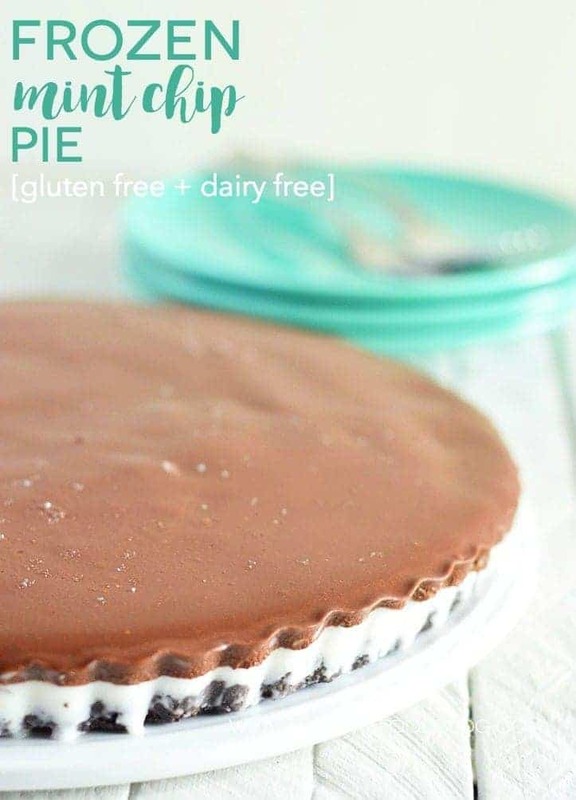 Todays recipe, a Frozen Mint Chip Pie, is one that I created for the So Delicious “Coolest Creamiest Dairy Free Recipe Showdown”. 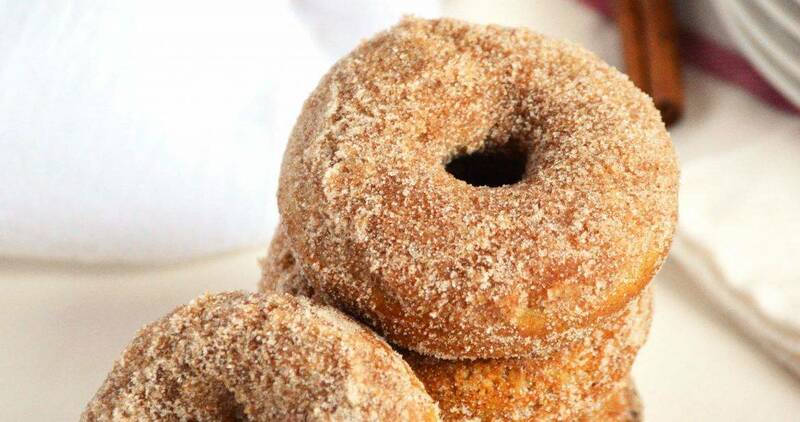 I’m putting this recipe up against 20 other gluten free / dairy free food bloggers, all of whom I’m sure will have some stellar dairy free desserts to share. This is actually my first recipe contest. In all the years that I’ve been baking and cooking, I’ve never entered a recipe into a contest. I’m not really sure why, since I’m super competitive. I really feel like I’ve brought my A-game with this frozen mint chip pie. It’s a very simple, no-bake dessert but it is completely satisfying. Sometimes simple is better and that’s exactly what this frozen mint chip pie is. It calls for just a few ingredients. 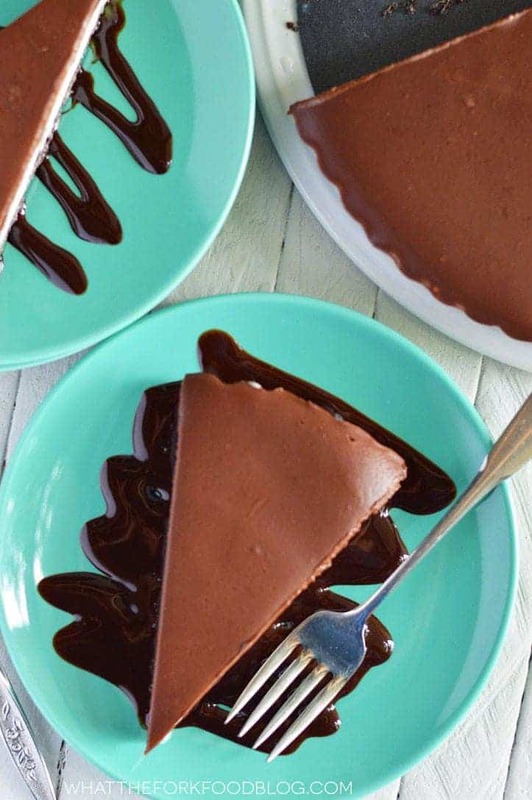 If you’re a chocolate mint fan, you’re going to love this. My dad is a big mint fan. Last year, I made him some Andes Mint Chip Ice Cream for Father’s Day so this year I made him this frozen mint chip pie. It was a hit. I mean really, you can’t go wrong with a chocolate cookie crust, coconut milk based mint chip “ice cream” and a chocolate ganache. When I made this for my dad, I made it in a 9-inch spring-form pan. This time, I made it in an 11 inch tart pan which is what’s pictured. You can make it in either but I preferred the thicker pie in the 9-inch pan. The beauty of this is the So Delicious Mint Chip “ice cream”. It has a coconut milk base and is a totally and delicously acceptable replacement for dairy based mint chip ice cream. It’s great for my lactose intolerant daughter who also loves mint everything. Be sure to check out my Vegan Avocado Ice Cream or my Dairy Free Freezer Cake (which both also happen to feature So Delicious products), or my Flourless Chocolate Mint Brownies OR Mint Chocolate Chia Seed Pudding if you’re craving an extra serving of mint. Enjoy! 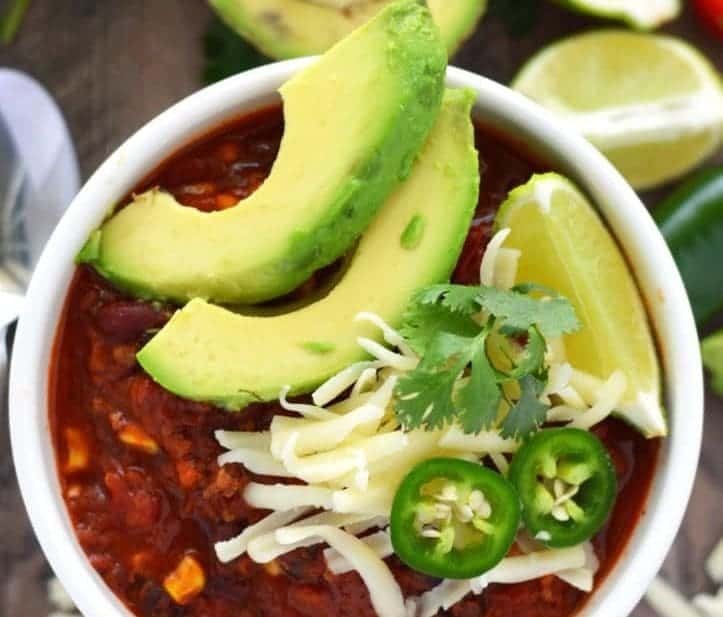 PS This recipe contest is hosted by Alisa from Go Dairy Free and So Delicious. Be sure to follow the #RaiseAPint hashtag on Instagram or Twitter to see what everyone else will be sharing! This frozen mint chip pie is a creamy, dreamy summer dessert. It's an easy make-ahead, no-bake dessert that'll please any mint lover in your life. Place the chocolate sandwich cookies in the bowl of a food processor and pulse until the cookies become fine crumbs. Mix the crumbs with the melted shortening until all the crumbs are moistened. Press the crumbs into the bottom of a 9-inch spring form pan (or 11-inch tart pan) making sure it evenly coats the bottom of the pan. 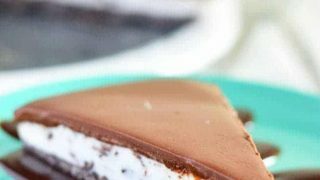 Freeze the crust for 15 minutes (or longer) while the mint chip non-dairy frozen dessert sits out at room temperature. It may take 20+ minutes to become soft enough to scoop and spread. When the mint chip has softened, scoop it onto the crust and use a wooden spoon or off-set spatula to spread it evenly over the bottom. Freeze for 30 minutes. 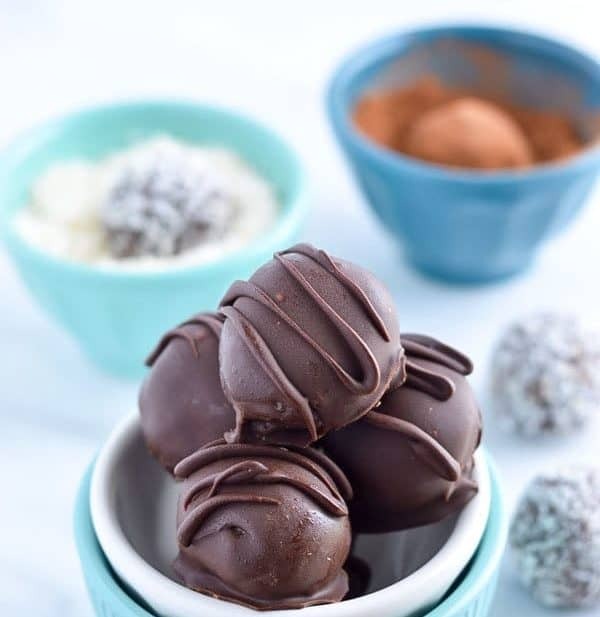 When the mint chip base has re-frozen, prepare the ganache by adding the chocolate chips and coconut milk to a microwave safe bowl. Melt at 50% power for 60 seconds. Stir the chocolate really well then heat again at 50% power for 30 seconds. Continue to heat at 50% power for 15 seconds (stirring after each time) until the chocolate is melted. Pour the ganache evenly over the mint chip base. Freeze until ready to serve. Before serving, let the mint chip pie sit at room temperature for 10-20 minutes before slicing. This post contains affiliate links for ingredients and/or equipment used to create this delicious dessert. I could go for a big slice of this pie right now! 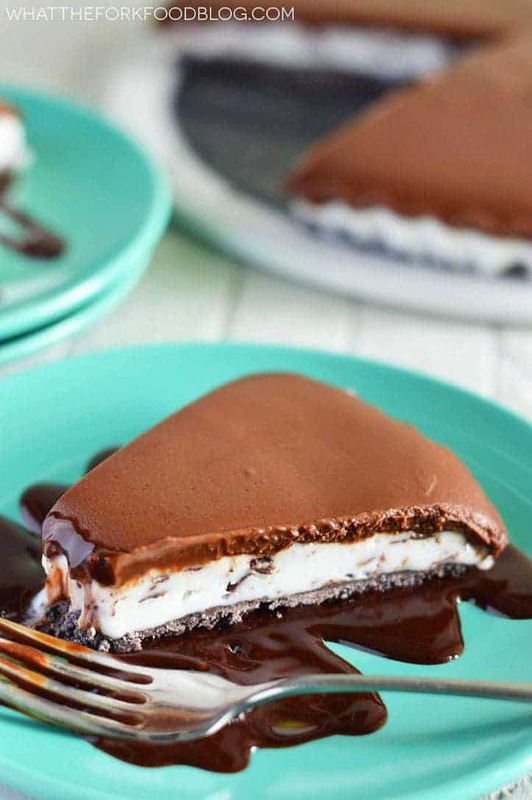 What is the chocolate topping on the top of the mint ice cream? This looks delicious Sharon! I love how easy it is to make too :). Whoooaa, if this does not win I would be floored! You have created perfection! You can’t ask for much more than this for a delicious summer dessert! 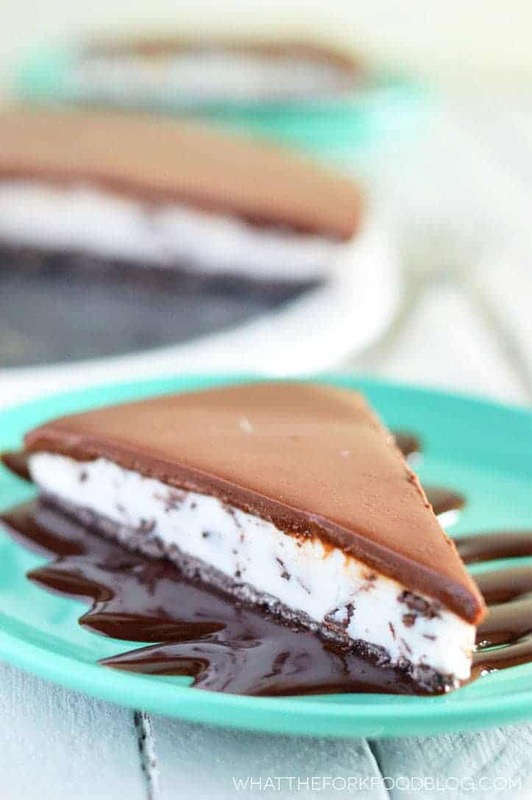 Easy, no-bake, and tons of mint and chocolate. I agree, I give you an A for this pie! This looks like a winner! Good luck in your contest. This would make a fab treat — looks so rich! I saw this earlier on FB and wanted to come through my screeeeen!! That’s one amazing, WINNING PIE! I love you. As simple as that. This pie is beautiful and I can just imagine the taste. Pinning and making. This is beyond words Sharon! It looks so amazing but so easy! Lucky me, I almost always have those ingredients on hand. This looks like a winner, and it sounds easy to make. Perfection. I love the So Delicious ice cream. One pint lasts me at least four meals. It is delicious, but impossible to overeat. My favorite flavors are the chocolate cookies and cream , and the salted caramel cashew. Best of all, my guys eat regular ice cream and leave mine alone, which is why I can get four servings out of them! You will win with this recipe, for sure.